It’s one of those things that everyone does slightly differently. Some people roast their own peppers, some people use the jar of pimientos. Some people add cream cheese, some don’t. Some people add olives, and some add eggs. 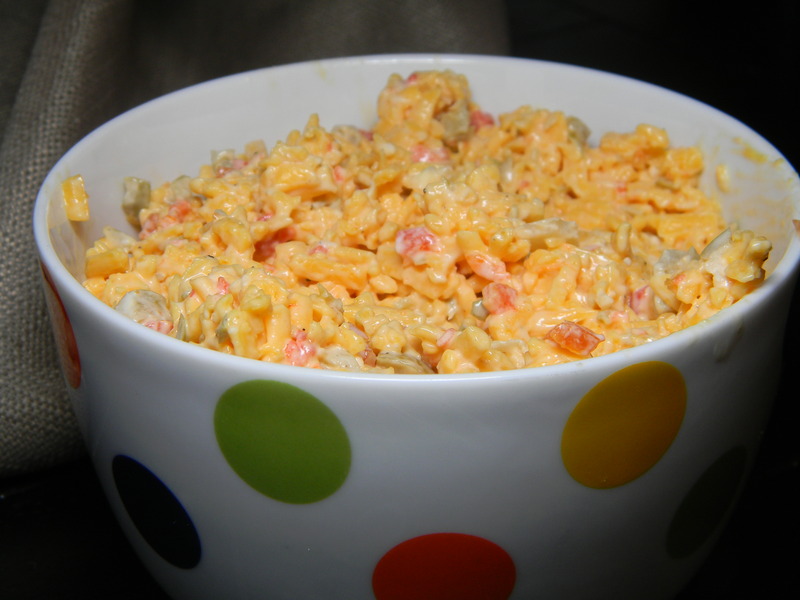 Some grind their pimiento cheese into a spreadable orange mess, and some leave it really chunky. I’m not claiming, by any stretch of the imagination, that this recipe is the best, but it’s pretty freaking good. In fact, I’ve come up with 3 excuses to make it this month. I just.can’t.stop.eating.it. It’s a problem. If you’re willing to share it, I’d LOVE to see your recipe for menta cheese. After all, I need to come up with more excuses to make it over and over. Do you use olives? eggs? cream cheese? special cheese? I’d love to know. Send us a note via the Email us page, or leave a comment below. So far, we’ve put this on sandwiches, served it in little endive leaves, served it with crackers, baguette rounds, and chips. We’ve also made a “menta cheese dilla” (pimiento cheese quesadilla), which we’re convinced is the next great food-truck idea. How do you serve it/eat it?